Demand is increasing, as it fits perfectly into the ever-popular Scandinavian interior design style. The fir, or rather the silver fir, is currently experiencing a flight of fancy. The "silver fir" has a bright, white-gray bark. The wood itself is light yellow in color and impresses with its vibrant appearance. Another special feature of the silver fir is that its wood is almost resin-free. Resin can only be produced for wound closure. Thanks to the absence of resin, the fir is extremely well-suited for the manufacture of planks and furniture. 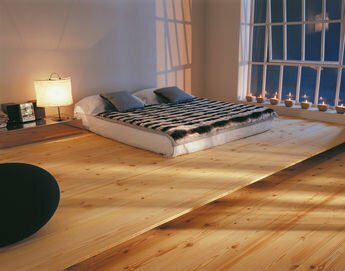 In particular, the warm character of floorboards made of fir creates a cozy and positive atmosphere in the room. Even over the years, the wood hardly darkens and retains its original, bright, natural color. Wood from Austria - for hotels or personal use. The fir is a native wood to Austria that is perfect for the alpine decor style. Combined with modern interior design, the fir provides an exciting contrast. This has been impressively implemented, for example, in the Austrian Alps, at the Kempinski Hotel in Jochberg. 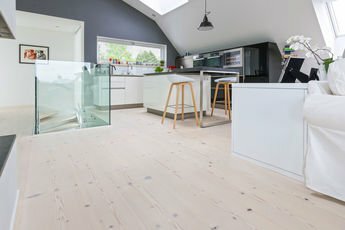 Bright wooden floors for every style. In the "Alpin" collection you will find three different variations of wide boards made of fir wood. The pine planks are available in: brushed / lye treated / white oiled, brushed / natural oiled and brushed / white oiled. The particularly stable raw material comes from winter-thinned tree trunks from native mountain forests. The typical features include bony, firmly grown branches and a distinctive formation of the annual rings. Compared to other woods, it is a slightly softer wood. Small traces of usage such as pressure points are possible, but can also be revitalized with regular soap care. Get your consultation appointment here!